Mission Moments: Transfers! FHE! Family History! This has been a most interesting week for transfers. To start with, it's not even transfer week, but there are about 10 missionaries going home so they can start school soon. There are no new missionaries coming in for another two weeks . . . the normal transfer week. Elders P (DL) and C (ZL) were two from our zone that went home. This left Elders S (ZL) and Y without companions. Elders S and Y are now companions for two weeks. 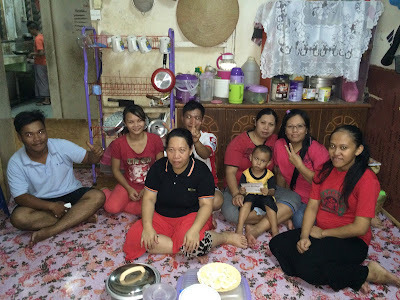 The other ZL is Elder H in Mukah until he goes home in two weeks. Elder S (Chinese Elder) is now the DL here in Sibu. So we now have one Malay set of missionaries covering two Malay speaking branches for the next two weeks and one Chinese set caring for the Chinese branch. We are hoping that the next transfer will give us at least one more set of Malay speaking Elders. We really need them here. Monday night we had FHE with members of Branch 1. It was also final good-bye to Elder C. He gave a great lesson on tithing. There were a few members at FHE who needed to hear what was said. Today was Elder S's first district meeting. I really enjoyed his training. We had the usual role playing, and then he got into the training. He had us each draw a picture of one of our favorite scripture stories. After which we shared and had to guess first what story was depicted by our picture and then explain why the story meant something to us and how it relates to the lessons in Preach My Gospel. The discussions were meaningful as we related each story, its meaning, and how it related to lessons in Preach My Gospel. None of us had the same story. The stories included the the Jaredites crossing the ocean in their barges, the prodigal son, Joshua at the battle of Jericho, the three Nephites and their desires to serve, Christ blessing the little children in 3 Nephi, and King Benjamin preaching his final sermon. With a little modification, this would be a great activity for Family Home Evening. After district meeting, the six of us went to lunch at a little open air place that's been recently discovered by the missionaries. The food is good and inexpensive. The Chinese food there is very good. No American or Western food served there at all. Elder S enjoying his food. Elder S? I don't know how I caught that expression! Elder and Sister Hammer, a senior couple from Kuching who are over Family History, arrived Thursday evening. Elder and Sister Mills picked them up and drove them directly to Sibu Jaya where they presented an introduction to Family History. The Mills drove the Hammers back to our place that night. The Hammers spent the night with us (Friday night, too). Friday evening they ran concurrent presentations in Sibu; one for the Chinese Branch, the other for the two Malay speaking branches. Another presentation was made Saturday afternoon in Malay before the Hammers took off for Mukah for the presentation on this tour. They will be back with us Monday before flying back to Kuching in the afternoon. The presentations went very well. Over 50 people were introduced to the Family History program. Most of them got registered on familysearch.org so they could get started getting their parents and grandparents information recorded. They were all eager to start. Most of them have smart phones so they downloaded the two apps that the Church has for Family Search. We helped in the registration process. In getting one sister registered, we discovered that the records had her grandfather still living. This couldn't be because they had had his temple work done. After researching we found that her grandfather had been entered twice. Once with the wrong birth date and still living; the other with the correct information from which the temple work had been done. We're in the process of deleting the "living" records since they are not correct..
We took the Hammers to the Chinese Tiger Temple. If you missed the photos before, here are some fresh ones. I guess you call these guys TNMT . . .
No, not teenage ninja mutant turtles. Don't be silly. This guy looks like he just stubbed his toe! This just found his prized marble! These are temporary workers quarters. They're usually set up where construction is happening, such as the buildings in the background. Can you see the rooster in the chicken coop in lower center of the picture? It's been a pretty busy weekend. Sister Bodell spoke in Sacrament meeting in Branch 1. Yes, in Malay. She did a great job! Everyone was listening (That's a little unusual right there!). Here topic was based on Elder Nelson's conference talk on making the Sabbath a delight. She began her talk with a story (That's unusual here, too.). Her talk was well-received, and we had great attendance today, including some from Monday's Family Home Evening and several investigators. A little later the Branch 1 president had me come into his office. I now have a calling in Branch 1. I'll keep it under wraps until I'm sustained next Sunday. Things could change between now and then. Unless things change between now and then I will be helping out on the computer. A quick addition here . . . Our daughter, Amanda, was able to attend Elder Chang's homecoming on Sunday. Here are a few photos she shared with us this. Elder Chang was born of goodly parents. Definitely a hard habit to break! It has been such a blessing to work with these young missionaries. They sacrifice so much to share the Gospel of Jesus Christ with other people in strange lands with strange languages. They do it so well. They do it because they know The Church of Jesus Christ of Latter-day Saints is the Lord's organized church on the earth. We have a living prophet and apostles just as Christ did in His Church during his time. That church was taken from the earth when the ancient apostles were killed. It had to be restored. That was done through the Prophet Joseph Smith. Along with these wonderful missionaries, I add my testimony that I know that things are true. What a blessing it is to have a living prophet to guide us in these latter-days!